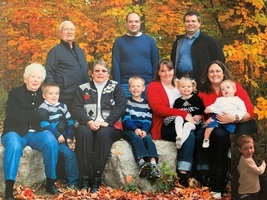 Provide comfort for the family of Dorothy Smarac with a meaningful gesture of sympathy. Passed away peacefully March 26, 2019 at Stevenson Memorial Hospital in her 95th year. Loving wife of Eddie Smarac (predeceased). Loving mom of Erna (Glen Cameron) and Stefan (predeceased). Loving grandma of Michael (Heather), Mark (Amanda) and loving great-grandma of Kalvin, Victoria, William, Matthew and Nathan. If so memorial donations to the Heart and Stroke Foundation or the Canadian Cancer Society would be appreciated. Arrangements entrusted to Drury Funeral Centre. Provide comfort for the family of Dorothy "Dot" Smarac by sending flowers. Our condolences to you on the passing of your mother/ grand-mother. For a number of years Dorothy faithfully attended Bible Studies and Hymn Sings at Kingsmere. She loved to sing. She often showed us her Bible either from her dear husband or to her Eddie given shortly after their marriage. She showed surprising insights during Bible Studies, even after dementia was evident. Dorothy's great wish was to go to P.E.I. and swim in the ocean again. We are sure that in her earlier years she was a vibrant teacher and very special lady. Leona and Bill Menary . My sincere sympathy for your loss. I was so saddened to hear of Dorothy’s passing. Dorothy was such a ray of sunshine in my day to day life. Singing “you are my sunshine” with her, was a frequent occurance. She would smile and laugh as we sang together. Her stories of swimming in the ocean out east, brought her back to a time of great happiness...her eyes would sparkle while she reminisced. I will gravely miss my friend, but all the beautiful memories she gave me will continue to make me smile and giggle. Love you Dorothy! Until with meet again! May the family of Dorothy Smarac please accept my sincere condolences hoping you find comfort in God's words at Acts 24:15 and Psalm 37:29.